Matt Slauson #68 of the Chicago Bears watches from the sidelines as his teammates take on the Miami Dolphins during a preseason game at Soldier Field on August 13, 2015 in Chicago, Illinois. The Bears defeated the Dolphins 27-10. 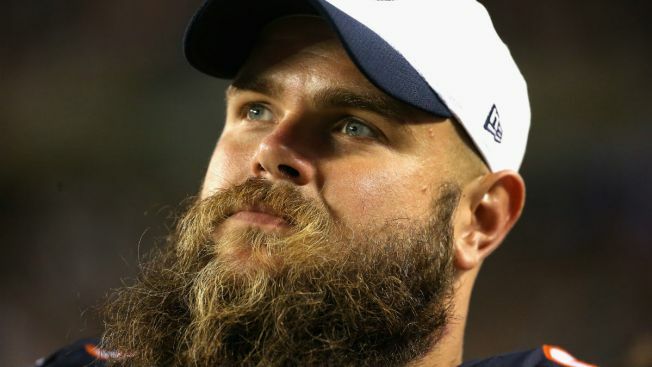 Former Chicago Bears lineman Matt Slauson suffered a devastating injury during a game last week, but doctors told him that things could have potentially altered his life forever if not for some good fortune. Slauson, who played for the Bears from 2013 to 2015, was playing right guard for the Indianapolis Colts on Thursday against the New England Patriots when he broke two vertebrae in his back, he told media on Wednesday. Slauson continued to play with the injury, and if he had suffered one more big impact in the game, doctors told him that he could have ended up paralyzed. “I had no idea how close I was to changing my family’s life,” he said. The Colts have placed Slauson on injured reserve, ending his season, but have asked him to stay with the team and to attend practices.